Today morning I was longing for something sweet with cinnamon. I did not want to spend much time with the preparation, that is why I chose these muffins: easy, fast and small cinnamon bombs. Preheat oven to 175°C. In a bowl sift together all dry ingredients. Add wet ingredients and stir until combined. Grease a muffin form and scoop batter into it. Bake for 20-25 minutes. 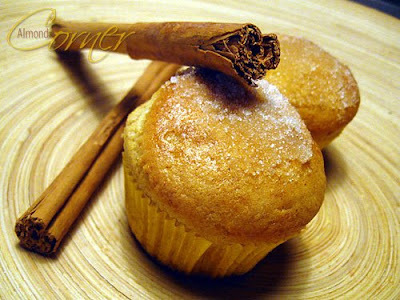 Dip warm muffins in melted butter and then in the cinnamon-sugar mixture. Serve it warm. Yum2! hehehehe.. I'll try to make this someday! =) thnx to this blog! =) if you have time kindly visit my blog too.. These muffins look wonderful! I bet they taste heavenly... I also make muffins when I don't want to "lose" time in the kitchen! umm.. these look so yummy.I will definately try the recipe out .